Clay-walled and cruck-framed agricultural building; 2 compartments perhaps originally comprising barn and byre/stable, but now a store. Long rectangular-plan with clay-walled central partition and 5 pairs of crucks. 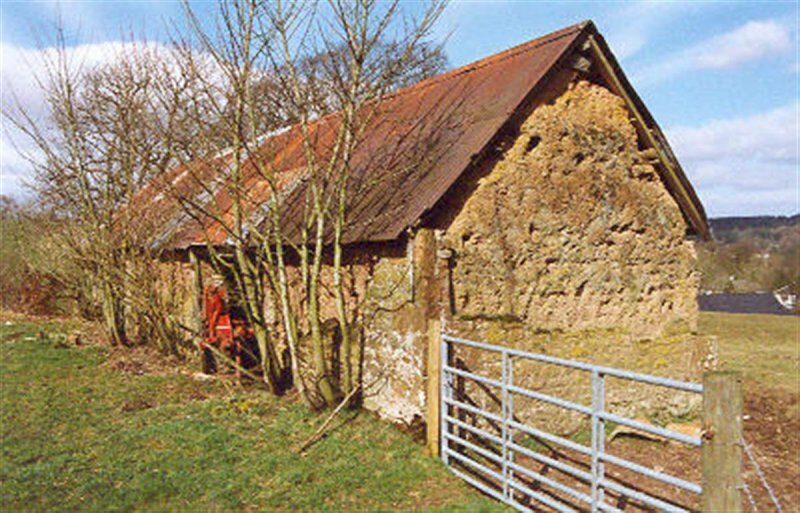 OUTER WALLS: rubble footings, narrow coursed clay/pebble mix bound with intermediate layers of straw; substantial repairs in rubble and ashlar including some 19th century stugged quoins. Rectangular opening central on S wall of each compartment with ashlar dressings. 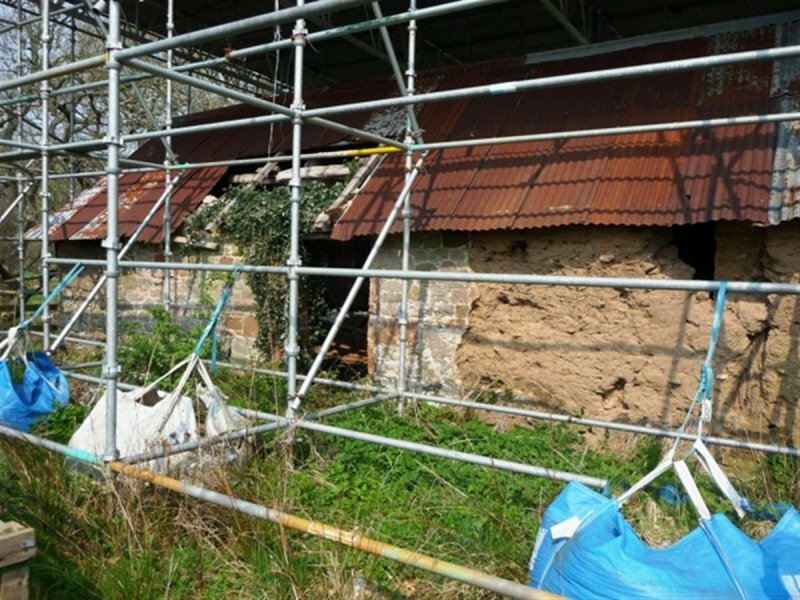 Original walling badly damaged at W and replaced by corrugated iron sheeting. CRUCKS: fairly large and well-wrought crucks on stone footings set within wall thickness; collar-beams half-lap jointed and pegged to blades. Central cruck frame encased by partition wall, latter stabilised by timber lath frame: W compartment ('original byre/stable) has cobbled floor, and brick repairs on inner face W gable; E apartment (at slightly higher level) has earthen floor. Roof originally thatched, now covered with corrugated iron. The rest of Priorslynn Farm is not at risk. 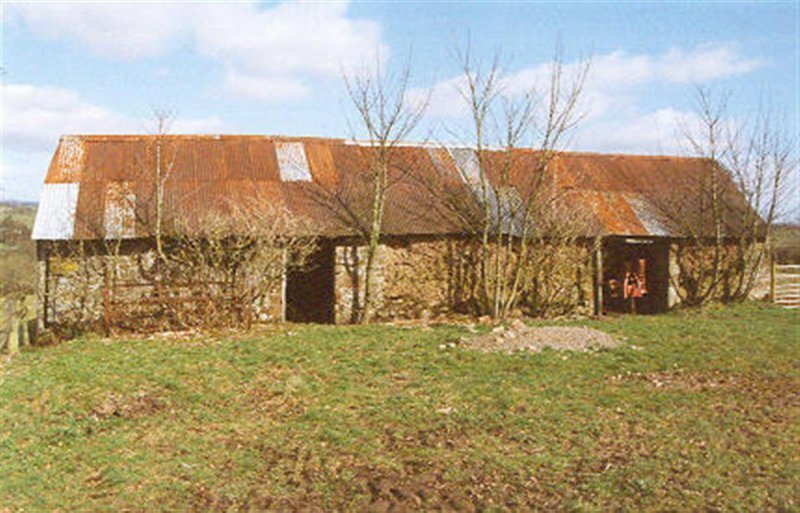 July 1997: Permissions are sought for alterations to Priorslynn Farmhouse, the formation of new vehicular access, and the demolition of the cattle shed. 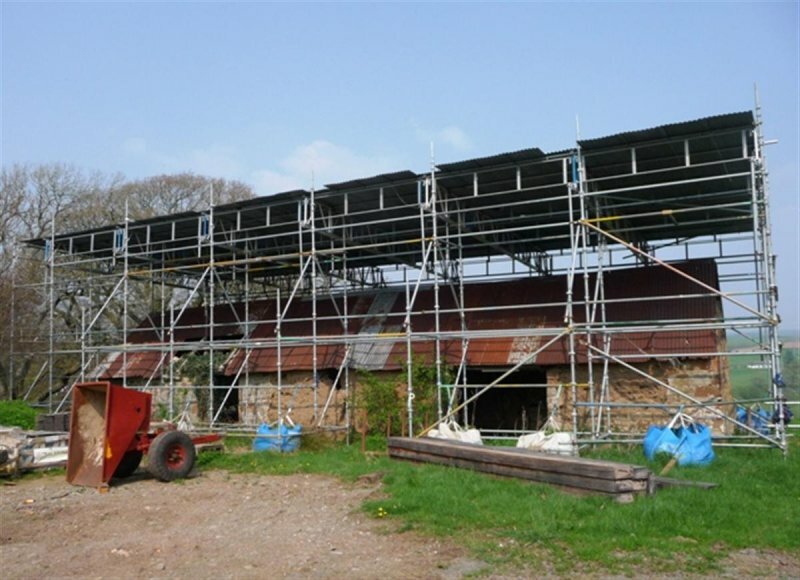 The cruck barn is not included in the plans. March 1999: SCT understands that the barn has stood unused for several decades. The present owners do not have a use for the building, and are open to expressions of interest. 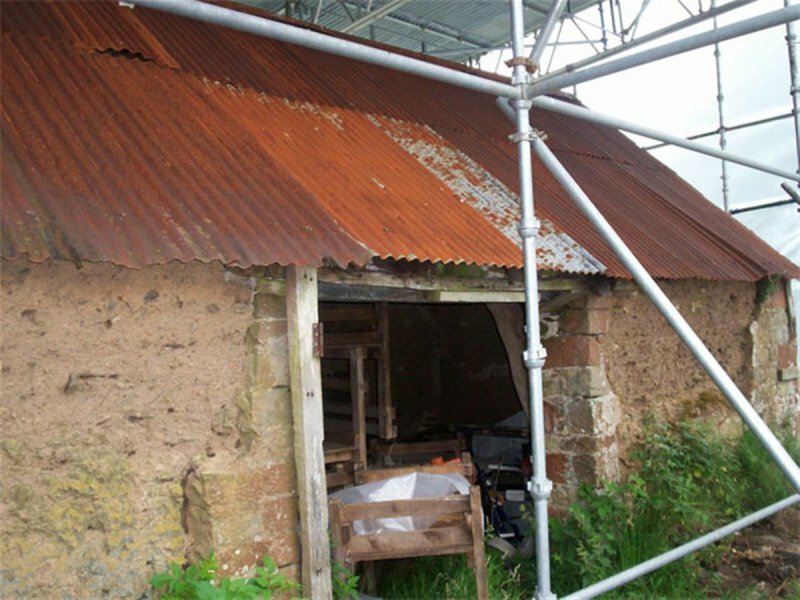 July 2008: External inspection finds that the barn is in very poor condition. The walls are crumbling. The roof is rusty and some sections are missing. 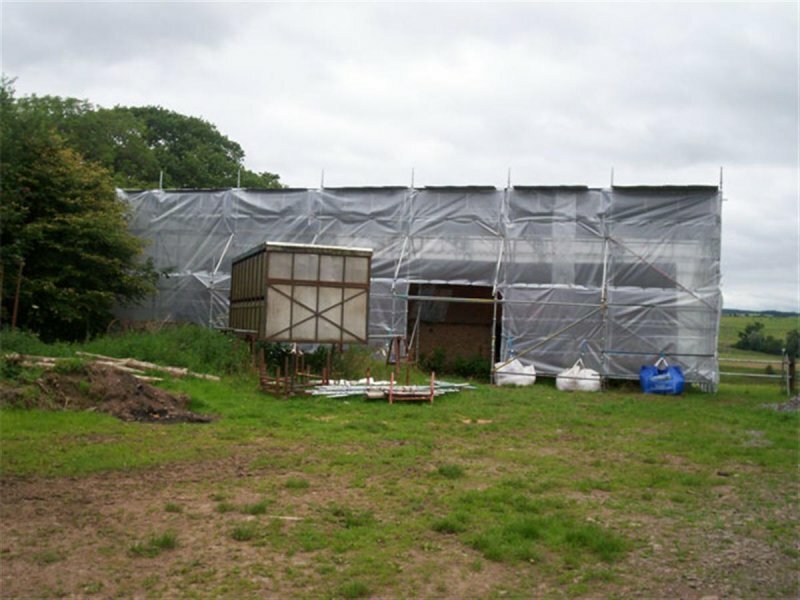 Scaffolding has been erected round it and it is covered in plastic sheeting to provide protection. 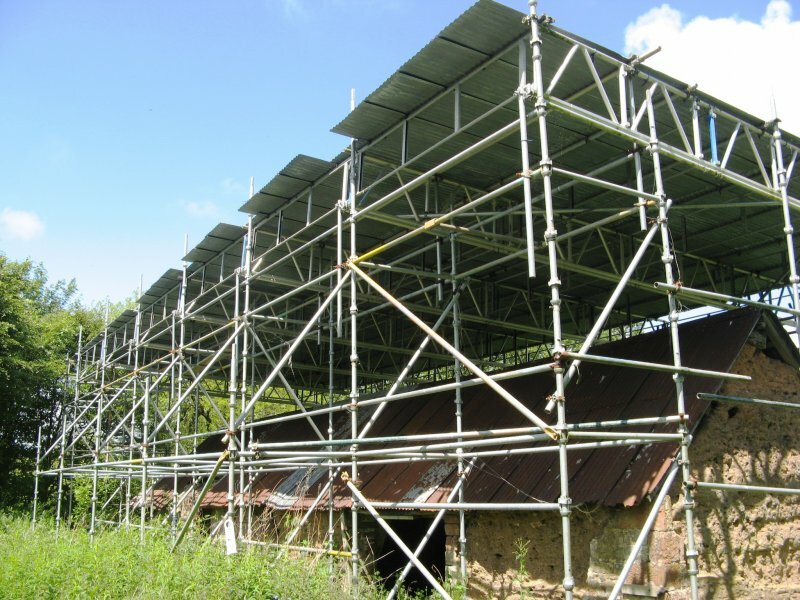 April 2011: External inspection finds the protective sheeting, present in 2008, has been lost or removed. The building itself seems little changed. 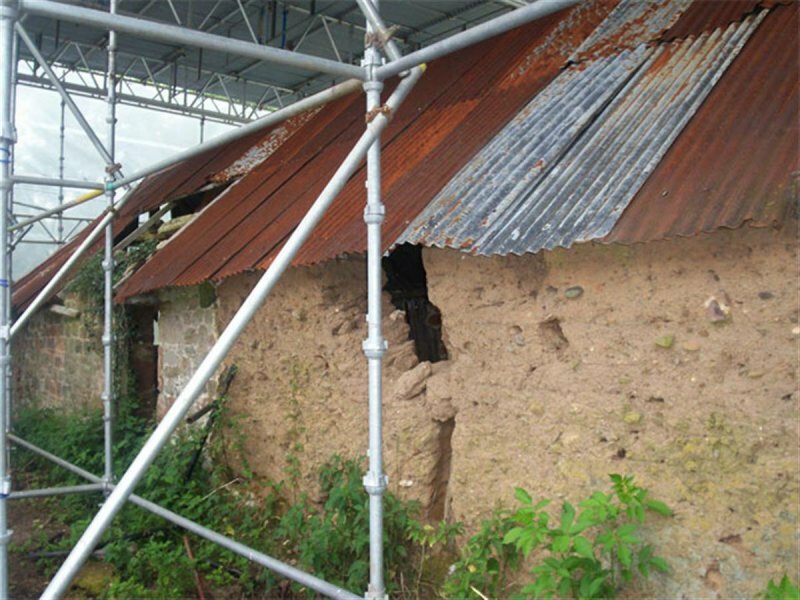 11 June 2014: External inspection finds the building remains in much the same condition as seen previously. 24 January 2018: Listed Building Consent for repairs, re-instatement of a thatch roof and change of use to form two huts is being sought ref: 17/2131/LBC. Supporting documents submitted as part of the application note the property has recently been purchased by a new owner. Alcock (1991), p86; Gifford (1996), p154; Hume (2000), p92; Stell (1986), p69; Eastern Dumfriesshire (1997), pp241-242, 319; Transactions of the Dumfries and Galloway Natural History and Antiquarian Society, vol. XLIX, 1972, pp39-48.